Outside organizations such as government regulators and industry associations could prove to be crucial factors in moving these industries forward. For instance, all US mining operations are required to report injuries to the Mining Safety Health Administration (MSHA). Therefore, a high percentage of M&M companies are able to disclose information on their workplace health and safety issues. Unfortunately, MSHA does not require companies to publicly disclose their reports to this agency. 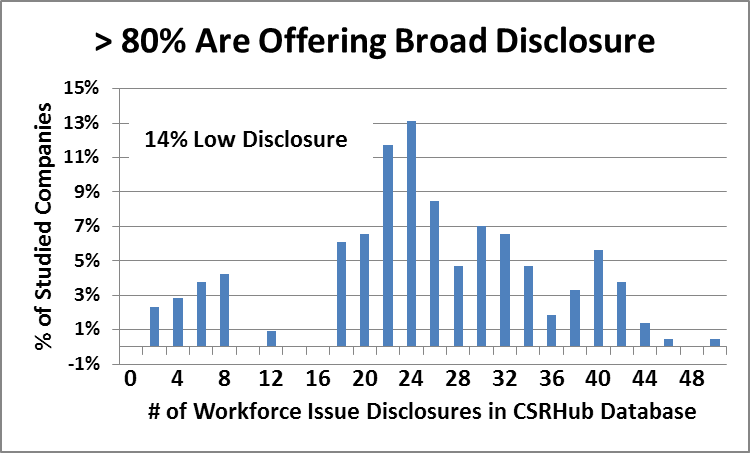 Each company tends to to take its own approach to the scope and format of its public disclosure—and outside sources interpret these results in different ways. The result is that the same company may get a good rating from one source and a bad one from another. MSHA probably cannot change its disclosure rules without Congressional support—but, it could provide a pathway for sharing more of data—and for encouraging more consistent reports—by inviting companies to declare that their raw original filings can be collected and shared. (This is similar to some of the efforts that have been undertaken in the supply chain area. For instance SEDEX allows customers to share their audits of suppliers with one another.) Then, sources who analyze this information would at least have the same starting point for their work—and companies could better compare their performance against those of their peers. In AA&F the Sustainable Apparel Coalition (SAC) has led the way towards improved supply chain management for its members, by creating the Higg Index. This set of tools is designed to help organize and harmonize supply data for the AA&F industry. Unfortunately, only 21 of the 159 companies we studied in our AA&F report (13%) are members of SAC. Note that their perceived sustainability performance is well above the average for the non-members. The AA&F industry has formed special organizations to respond to supply chain issues. For instance, in response to the Rana Plaza collapse, a group of European-based clothing companies set up the Accord on Fire and Building Safety in Bangladesh (Accord). This group has grown to include 220 members, of whom 67 are tracked by CSRHub and 14 are part of the SICS group of Apparel, Accessories, & Footwear companies. A second group of 17 mostly US companies set up the Alliance for Bangladesh Worker Safety (Alliance). Labor unions and other NGOs have criticized the garment industry for failing to create a unified response and for some of the actions of both groups. In general there has been more support for the Accord group than for the Alliance (see this Clean Clothes Accord analysis, for instance), but both groups have been harshly criticized and many of the problems that underlay the Rana disaster (and the previous deadly fire also in Bangladesh, at the Tazreen factory in 2012), continue to be present. Still, companies in both groups seem to have sustainability performances that are above the level for the industry in general. This indicates that a combination of intra-industry leadership and external pressure could help move the AA&F industry forward. More details on these findings are available in the SASS reports on these two industries. In these three posts, we have shown that it may take many years for two industries to disclose all of the investor-material information that is described in the SASB standards. During the adoption period, investors who desire the material information described in these standards will either need to work with partial data, use indicators that correlate with or can otherwise substitute for the desired metric, or invest in only those companies who have adopted the standard. We do not know which approach will dominate or how long it will take before compliance becomes the norm and not the exception. However, the next few years are likely to offer exciting opportunities to investors who specialize in using non-financial sustainability-related information. See The SASS (Sustainable Accounting Standings Series) Apparel, Accessories and Footwear Industry Report. See The SASS (Sustainable Accounting Standings Series) Metals & Mining Industry Report. 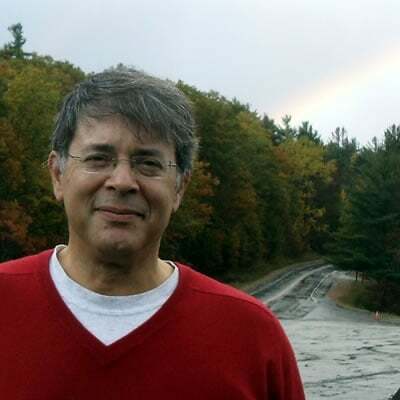 See part 1 of the Implementing SASB series. See part 2 of the Implementing SASB series. Despite the generally higher level of reporting within AA&F than in M&M, most of the companies in both industries do not appear ready at present to implement and report the metrics involved in the SASB standard. This is because each industry’s “topics’ and “metrics” are different and the “bar” set for both industries is well above current practice. The eleven M&M topics cover reporting of labor issues, carbon production, and other aspects of company operation. The four AA&F topics focus mostly on these companies’ supply chain and the risks that are in them. 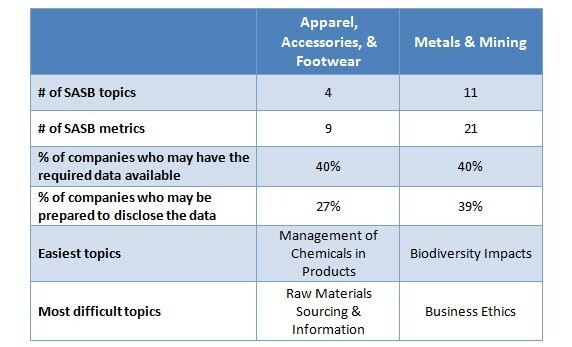 This table summarizes the percentage of companies that in each industry that our data indicated could be ready to report each topic. As you can see, we believe only 40% of the companies we studied in each industry have the data required to satisfy investor’s needs for material information. The remaining companies (and for M&M, we must add the 75% of companies who had so little available data that we could not study them) could not disclose the data suggested in the SASB standard, even if they were willing to do it. For example, the M&M industry is asked to disclose data on their energy efficiency. About a quarter of the companies we studied seemed to be ready to do this. The rest were either only somewhat ready or not ready at all. A more complex requirement from the AA&F industry will be equally difficult to comply with for most companies in that industry. For example, the AA&F industry is asked to disclose the percentage of its suppliers who have been found to be out of conformance with various labor standards. However, our research shows that only 25% of the studied companies show evidence that they are disclosing this type of information. Over the past six months, we have been working with the Sustainability Accounting Standards Board (SASB) on a series of reports we call the Sustainability Accounting Standings Series (SASS). The reports are designed to help companies understand SASB’s guidance on the sustainability-related information that reasonable investors would consider material in their SEC filings. 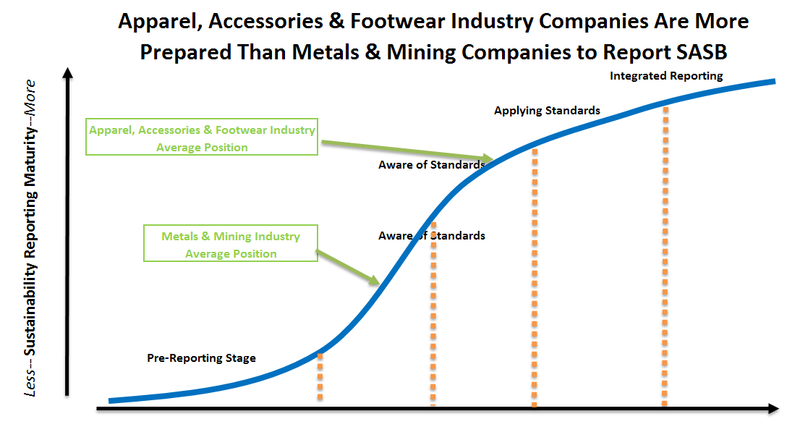 We have used CSRHub’s vast library of reporting information (we have collected 91 million pieces of corporate sustainability data and rate more than 15,500 companies) to assess the readiness of 280 companies in the Apparel, Accessories & Footwear (AA&F) and 1,799 companies in the Metals & Mining (M&M) industries. Although these completely different industries are each at a different stage in their journey towards integrated reporting, they face a number of common issues as they move towards integrating SASB’s guidance into their financial reporting. We used the SASB industry Classification System (SICS) to select the companies to study in each report. 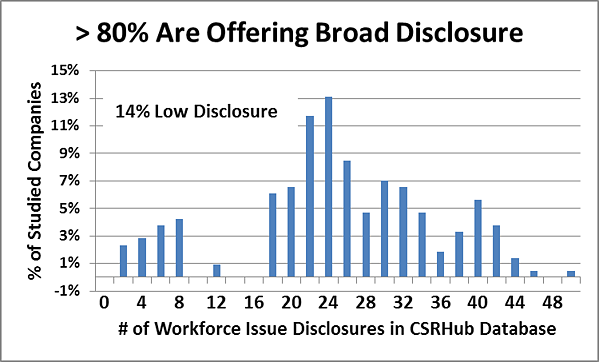 The table below shows that M&M companies are far behind AA&F on their reporting and disclosure practices. 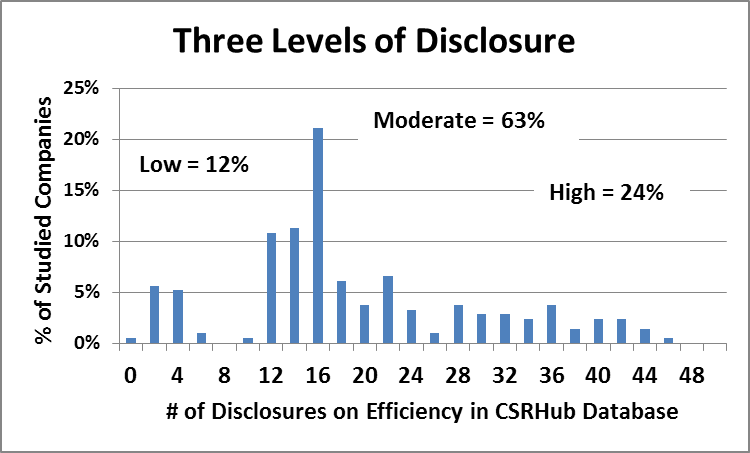 On the other hand, almost all AA&F companies have disclosed at least some sustainability data and almost half have reached the point where they can receive full CSRHub ratings. 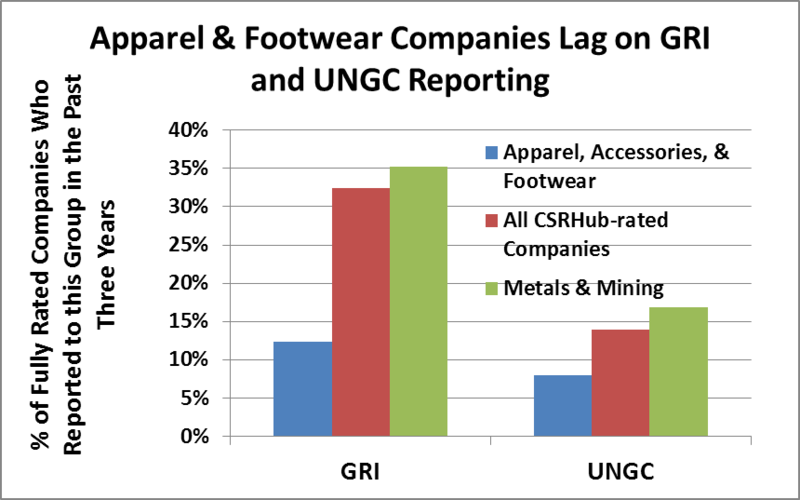 In contrast, the M&M companies CSRHub can rate tend have much higher rates of commitment to external reporting systems such as the Global Reporting Initiative (GRI) and the United Nations Global Compact (UNGC) than AA&F companies do. 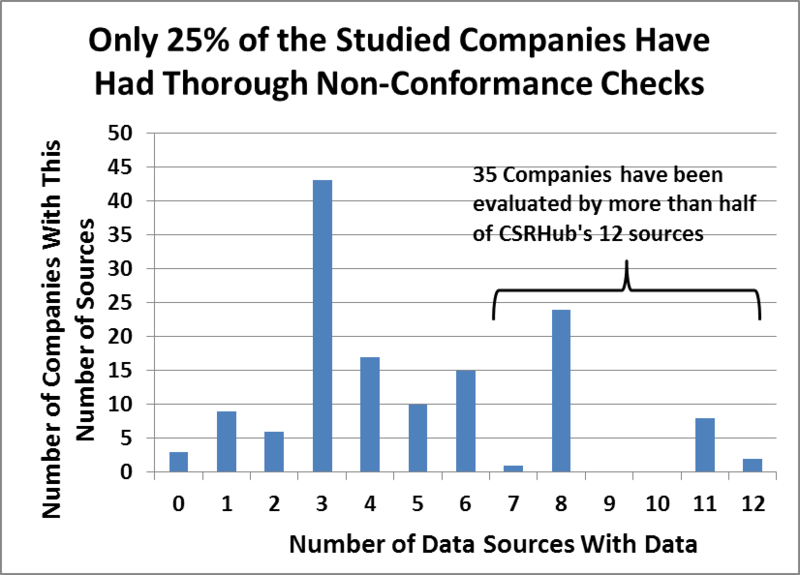 In fact, M&M companies have higher average reporting rates for these two metrics than do all CSRHub-rated companies. We suspect this difference may be due to the fact that AA&F companies have moved beyond basic reporting processes and towards more sophisticated methods. It may also be a result simply of selection effect when we compare a sample that has virtually all AA&F companies against the handful of M&M companies who have disclosed significant amounts of information. Another similarity is that the top five companies and bottom five companies in each industry look remarkably similar in terms of their perceived sustainability performance. 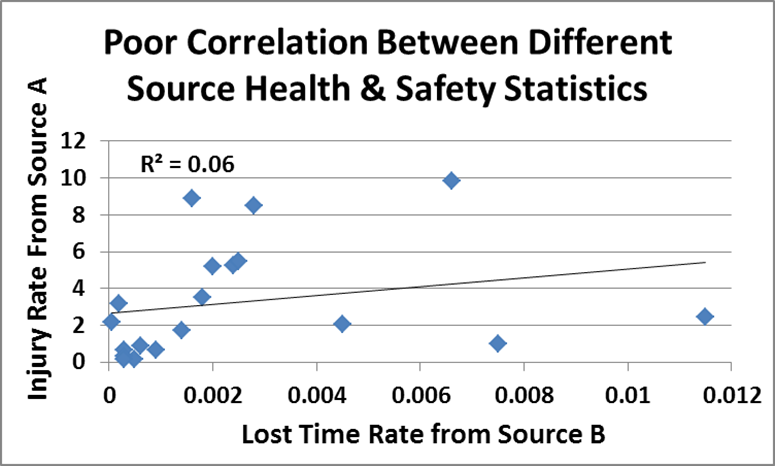 The two industries show a similar range of CSR behavior.